Connecting I-880 in downtown Oakland with I-580 (MacArthur Freeway) and California 24 by the Longfellow neighborhood in North Oakland, Interstate 980 is the Grove Shafter Freeway. I-980 provides a seamless route with the California 24 freeway extending northeast to the Caldecott Tunnel and the East Bay communities of Walnut Creek and Concord along the Interstate 680 corridor. I-980 also forms part of a regional link from the East Bay to the Port of Oakland, Alameda and Oakland International Airport (OAK). Interstate 980, from I-580 southwest to SR 17 in Oakland, was approved by the American Association of State Highway and Transportation Officials (AASHTO) on July 12, 1976. The Federal Highway Administration designated the route in 1983, and it was legislatively added to the California State Highway System in 1984. The final segment of the freeway opened to traffic on March 6, 1985. The tragic Loma Prieta Earthquake struck on October 17, 1989. One of the many structures to fail during the earthquake was the Cypress Structure along Interstate 880 (Nimitz Freeway) in Oakland. This double-deck viaduct served as the principal connection from the south to the San Francisco-Oakland Bay Bridge. As a result of its closure and subsequent demolition, traffic was detoured onto Interstate 980 to reach the bridge via the MacArthur Maze, the three-wye interchange connecting I-80, I-580 and I-880. This detour remained in place until 1999, when the replacement section for Interstate 880 (Nimitz Freeway) opened on a new alignment. Prior to 2011, Interstate 980 was unmarked on the mainline freeway, yet well signed from most approaches. This changed when confirming markers for I-980 were added eastbound after the 12th and 18th Street on-ramps and westbound after the transition from SR 24. Sign replacements adding exit numbers to I-980 east were installed in 2016. Broadway north at Interstate 880 (Nimitz Freeway) on the southwest side of Downtown Oakland. This overhead referenced I-980 east to San Francisco due to the previous closure of the Cypress Structure along I-880. It was still in place as of early 2018. Photo taken by Pete Sison (05/25/03). Interstate 980 separates from I-880 (Nimitz Freeway) northbound at a wye interchange (Exit 42A). The flyover ramp quickly splits with Exit 1A for 11th and 14th Streets. Photo taken 03/18/06. Exit 1A joins Castro Street, the east side frontage street of I-980, at 11th Street. 11th and 14th Streets link the freeway with Downtown Oakland. Photo taken 03/18/06. 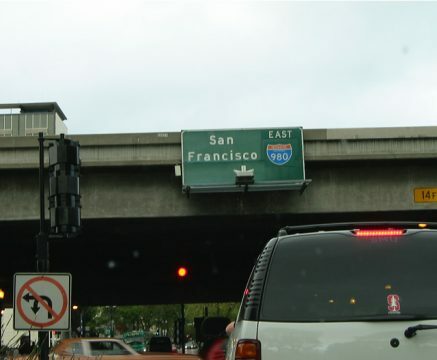 Exit 1B immediately follows from I-980 northbound at the 11th Street overpass to Castro Street north at 17th Street. San Pablo Avenue comprises a four-lane boulevard angling northward from Downtown Oakland to the city of Emeryville, where it becomes SR 123 (old U.S. 40). Photo taken 03/18/06. I-980 travels below grade between Brush and Castro Streets to the viaduct above San Pablo Avenue and Grand Avenue. The systems interchange with I-580 follows. Photos taken 03/18/06. A two-lane on-ramp from Castro Street at 18th Street expands Interstate 980 eastbound to five overall lanes. The right two lanes depart in a third of a mile for Interstate 580 (MacArthur Freeway). Photo taken 03/18/06. A four-level, symmetrical stack interchange joins the east end of Interstate 980 with I-580 (MacArthur Freeway) north to I-80 and the San Francisco Bay Bridge and south to San Leandro and Hayward. Photos taken 03/18/06. An on-ramp merges from Northgate Avenue as three lanes advance northward from I-980 to the SR 24 freeway to the Caldecott Tunnel and Orinda. Photos taken 03/18/06. The succeeding exit separates from the Grove Shafter Freeway below I-580 for 51st Street to Telegraph Road and Martin Luther King, Jr. Way north to Berkeley. Photo taken 03/18/06. Flyovers from I-580 combine ahead of a ramp split for both SR 24 east and the adjacent ramp to 51st Street and Martin Luther King, Jr. Way. Photo taken 03/18/06. Green outs on signs for Martin Luther King, Jr. Way cover Grove Street, the previous name of the arterial north to Adeline Street. California 24 next meets Claremont Avenue. Photo taken 03/18/06. California 24 becomes Interstate 980 after the ramp to I-580 (MacArthur Freeway) leaves the westbound mainline. Photo taken 07/18/09. Interstate 980 lowers to pass through the four-level, interchange with the MacArthur Freeway. Symmetrical stacks are uncommon in Northern California. Photo taken 07/18/09. Exit 2A departs from below the I-580 mainline for 27th Street and Northgate Avenue south to Grand Avenue. Photo taken 07/18/09. A high flyover shuttles motorists from I-580 north to I-980 west and the forthcoming ramp to 27th Street. This exchange dates back to 1961. Photo taken 07/18/09. Two lanes separate from I-980 west to 27th Street and the McClymonds neighborhood of Oakland and Northgate Avenue south to Uptown. Photos taken 07/18/09. Three lanes of traffic lower from the systems interchange with Interstate 580 to both I-980 west to Downtown Oakland and the 27th Street off-ramp (Exit 2A). Photos taken 07/04/06. The Downtown Oakland skyline coms into view as I-980 progresses southward across a viaduct spanning 27th and Sycamore Streets. Exit 1D follows as a split diamond interchange at the couplet of 17th and 18th Streets. Photo taken 07/18/09. A second set of viaducts carry motorists along I-980 over Martin Luther King, Kr. Way, Grand Avenue and San Pablo Avenue. Exit 1C connects the freeway with SR 260 (SR 61) south to the city of Alameda via 12th Street. Photos taken 07/18/09. I-980 drops below grade beyond the two-lane off-ramp (Exit 1D) for parallel Brush Street to 18th Street north and 14th Street to Downtown Oakland. Photo taken 07/18/09. Exit 1C quickly follows onto Brush Street south at 12th Street. Points of interest for Exit 1C include Oakland Convention Center, Jack London Square and Marina and the Alameda-Oakland ferry to San Francisco. Photo taken 07/18/09. The six lane freeway remains below grade, passing below 12th and 11th Streets beyond the on-ramp from 17th Street. Photo taken 07/18/09. I-980 south curves into a wye interchange with I-880. Exit 1B departs just ahead of the merge with I-880 southbound to Jackson Street. Photo taken 07/18/09. Interstate 980 ends with two lanes joining I-880 south to Oakland International Airport (OAK), Hayward and Fremont. Traffic partitions with Exit 1B to Jackson Street for the Oakland Waterfront, the Warehouse District, Oakland Museum and Laney College. Photo taken 07/18/09. Castro Street runs along the east side of the below grade section of I-980 to the west of Downtown Oakland. The first of two northbound on-ramps joins the freeway from 12th Street. Photos taken 12/30/01. Jackson Street north at the on-ramp to I-880. This sign was altered to reflect the 1989-99 closure of the Nimitz Freeway north due to the Loma Prieta Earthquake. The sign still references I-980 east to San Francisco as of late 2017. Photo taken 07/18/09. The on-ramp from Jackson Street to I-880 north joins the Nimitz Freeway just ahead of the split with I-980 east. This sign assembly was removed by 2016. Photo taken 07/18/09.